Chinese National Day celebrates when modern day China came to be every October 1rst. It usually lasts up to a week with a bunch of minor holidays thrown in for extra celebration and a chance for distant family members to get together. It is usually celebrated with a military parade and a flag raising ceremony in Hong Kong. This is a day all get off to enjoy a time with family and friends. The People's Republic of China was founded on October 1, 1949. 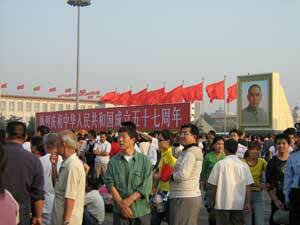 It was celebrated in Tian'anmen Square to which that December the government made it a national holiday.